Sometimes when I chew I get a sharp pain. What can I do to correct this? Most dental pain brought on by chewing is caused by a fracture, or crack, in the tooth. The pain can be corrected by placing an inlay/onlay, a porcelain crown, or with more advanced treatment. You want to correct the pain as soon as possible to prevent further damage to the tooth. Contact us today to schedule a visit. 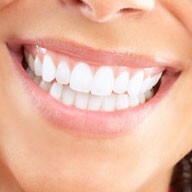 Porcelain veneers improve your smile by correcting a multitude of cosmetic concerns including: gaps in teeth; chips and broken teeth; dull or yellowing teeth that cannot be whitened with traditional means; “gummy smile” (showing too much gum when one smiles); and crooked teeth. Porcelain veneers broaden, straighten, whiten and beautify most any smile. This procedure can be done in as little as two clinical visits with your family dentist. Many of our patients feel like this was the best improvement that could have been done for their overall confidence. Ask us about how porcelain veneers can improve your smile at your next visit or send us an email. I want my teeth to be whiter. Do you recommend at-home or in-office whitening? We recommend at-home whitening under the care and guidance of our highly trained team. The Opalescence® Take Home Whitening Gels are a powerful, at-home procedure that allows you to whiten your teeth at your convenience – in a safe, effective, and customized way. You can find out more about Opalescence® Take Home Whitening Gels here. During your dental exam, we will talk to you about the best whitening plan that will work for you. There are a number of procedures available to help whiten your smile, from over-the-counter, at-home whitening products to in-office supervised treatments. Your dentist evaluates the potential for whitening your teeth based on their current color and the causes of any discoloration. Once you decide on the most appropriate method, you will spend anywhere from two to four weeks undergoing a series of simple whitening treatments.